Pound cake is the workhorse of the tea cart, able to withstand drowning in fruit syrups and whipped cream, or it can be easily tarted up with a citrus glaze. It’s the perfect thing to toss in the oven when you find out the new vicar is coming to tea in a couple of hours. Back in the mists of time, the closest most people had to a cookbook was a kitchen notebook in which they would keep track of things they had made in the past, in order to be able to make them again. But of course, that assumes the person in question could read and write, which most people couldn’t until the industrial revolution made paper and books affordable. Before there were cookbooks, recipes were passed on orally from mother to daughter or auntie to niece. 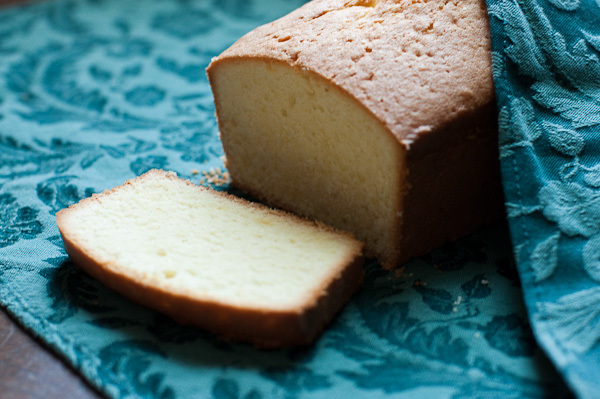 Pound cake is a perennial favorite because the recipe is so easy to remember. Even if you’re not the kind of person who likes to cook without a recipe (sort of like tightrope walking without a net), you can manage this one. It’s called pound cake because it uses one pound each of the four main ingredients, butter, sugar, eggs, and flour. It originated in northern Europe where ingredients for cooking were (and still are) measured by weight. The French have a similar cake called quatre quarts or Tôt-fait which means “four quarters” or “soon made.” The “four quarters” refers to the 250 grams of each ingredient which adds up to one kilo. Being an old recipe, this pound cake contains no chemical leaveners, relying only on eggs to help it rise. Consequently, you must cream your butter and sugar very well, and beat in the eggs one at a time. This is still a pretty dense cake, but all that beating will help prevent you from ending up with a doorstop. If you’re not convinced about using a scale to measure your ingredients, read this article from the Los Angeles Times by one of my favorite food writers, Michael Ruhlman. Pound cake is plain but quite rich, and easily dressed up with a bit of stewed rhubarb, homemade preserves, or for something really special, soak it in a bit of Grand Marnier and drizzle some chocolate sauce over it. 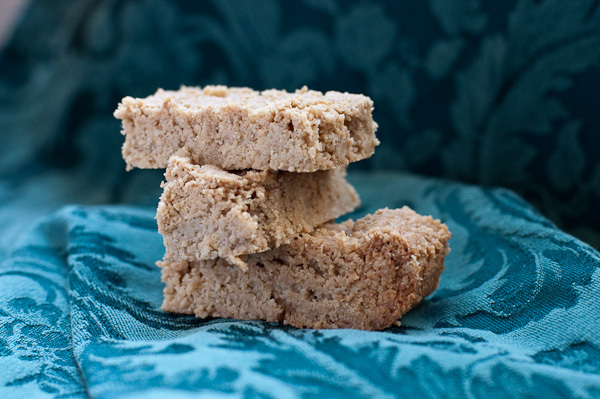 Next time you need to impress someone with last minute baked goods, don’t reach for a cookbook, just grab the kitchen scale and get to work. This makes a rather large cake. If you like, halve the recipe and bake it in a 9 x 5 x 3 inch loaf pan. In a mixing bowl use a fork to stir the flour and salt together. Put the butter in a large mixing bowl and use either a stand mixer or a portable hand mixer to beat the butter starting at a low speed and slowly increasing to a higher speed. Stop when the butter is the consistency of mayonnaise (about 30 seconds with a stand mixer or 1 minute with a portable hand mixer). Scrape down the sides of the bowl with a rubber spatula. Add the sugar and beat for 2 minutes at medium with a stand mixer or 3 minutes at medium with a portable hand mixer. 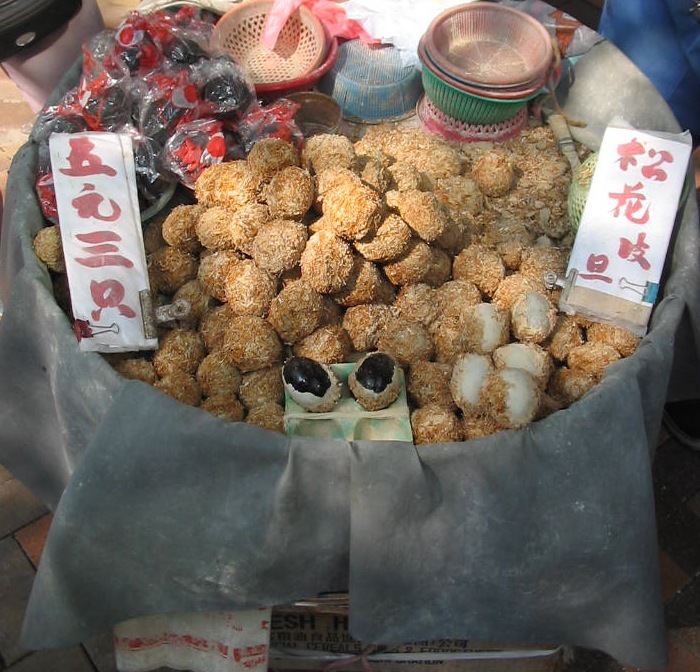 The mixture will be soft and whitish, but still granular looking. Add the eggs one at a time, beating well after each one. Stir in the vanilla. While beating at medium speed gradually add the mixture of flour and salt, scraping down the bowl as necessary. Continue to beat until the batter is smooth and homogenous. Pour the batter into the prepared pan and even out the top with a rubber spatula. Bake in the center of the oven for 1 – 1¼ hours, or until a toothpick inserted into the center comes out clean. Put the cake pan on a wire cooling rack and allow it to cool for about 5 minutes. Then remove the cake from the pan and allow to cool on the rack completely before serving. Variations: Add the grated zest of one lemon, or 4 ounces of raisins soaked in rum, or ¼ teaspoon of ground mace. In the past, I have expressed my withering disdain for single-use kitchen gadgets like garlic presses, shrimp de-veiners, and pineapple slicers. Today I’m adding another one to the list, the Raclette Machine. I’m bowled over that people are willing to pay hundreds of dollars for an appliance that makes a dish created by Swiss livestock herders who had nothing but a campfire, some cheese and a chunk of bread. I guess the idea is that doing the cooking at the table preserves the fantasy that we’re all sitting in front of a fireplace in our Swiss chalet? Come on. 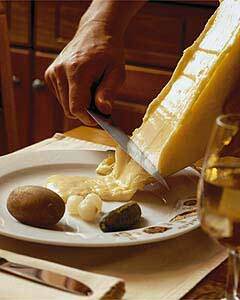 Raclette is the name of the finished dish and the name of the cheese which is the main ingredient. The semi-firm cheese is partially melted in front of a fire and then scraped (“racler” means “to scrape” in French) onto a plate filled with freshly boiled new potatoes, cornichons, pickled pearl onions, and crusty bread. Other popular accompaniments include thinly sliced cured meat such as the Swiss air-dried beef called Bündnerfleisch. To drink there is usually beer, tea or kirsch, although a nice dry Swiss white wine won’t go amiss either. But before we start cooking let’s talk about the most important component of this dish, the cheese. There are lots of cheeses out there labeled “Raclette” and they are certainly not equal. If you have access to a good cheesemonger who will discuss the cheeses and allow you to taste samples before cutting a piece the size you desire, go have a chat with them about Raclette. If you’re stuck buying pre-cut cheese from the case in an anonymous supermarket, learn to read labels. Good Raclette is a raw milk (au lait cru), semi-firm, cow’s milk cheese made in Switzerland or France and aged for three to six months. The Swiss Canton of Valais is particularly known for the high quality of its Raclette. So much so that the Swiss Department of Agriculture registered “Raclette du Valais” as an AOC (controlled designation of origin) product. If you have a chance to look at the whole or half rounds of the cheese, you might see the name of the village where it was made imprinted on them. Names to look for include Bagnes, Conches, Gomser, or Orsières. Raclette made in other parts of Switzerland might be labeled “Raclette Suisse.” These are not necessarily bad, but beware of industrially produced cheese made from pasteurized milk, it won’t be as good. Because Switzerland is not in the European Union, the AOC status for Raclette only applies within its own borders. That means that anyone from outside the country may make a cheese and call it Raclette. For example they have been making Raclette in the eastern part of France which borders on Switzerland (Savoie and Franche-Comté) for a very long time. It is done in a slightly different style which makes it softer and milder than its Swiss cousin. I’ve also had very nice Raclette from Puy de Dôme in the Auvergne region of France. Try a few and see which you like best. This gooey comfort food does cry out for a chilly autumn night in front of the fire with friends, but new potatoes are in the farmers’ markets of the Northeast right now, so I couldn’t resist making it in Summer. I used a milder French Raclette which was warm and cuddly, sliding like a lava flow over my plate of potatoes and pickles. This is a fun dish to serve to a large group. Everyone can take turns heating up the cheese and scraping it onto their plates. 1½ – 2 pounds Raclette cheese in a half-round or wedge shape. Build a good fire. Use a butter knife to scrape the brown rind from the cheese. If it is too thick, cut it off with a sharp knife. Put the cheese on an oven proof plate or a stone. Put the plate or stone right next to the fire with the cut face of the cheese (not the part where the rind was) facing the heat. Scrub the potatoes and put them in a sauce pan with salted water which covers them by 2 inches. Bring them to a boil and then turn the heat down and simmer them for 15-25 minutes, or until tender (time will vary with potato size). Drain the potatoes, allow them to cool a bit, and remove their peels. Keep the potatoes warm by putting them near the fire or in a 200 F. oven. When the potatoes are ready and the cut face of the Raclette is soft and gooey, put a few potatoes on a serving plate, carefully pick up the cheese (use oven mitts if necessary) and use a spatula or the back of a knife to scrape along the cut face, pushing melted cheese onto the serving plate. 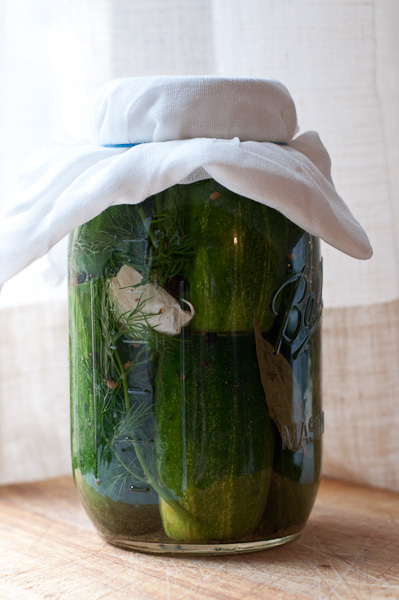 Add salt and pepper to taste and serve with crusty bread, cornichons, and pickled onions. Put the cheese back in front of the fire so it will be soft for the next round. Any leftover cheese can be wrapped and chilled to be used another time. Scrub the potatoes and put them in a sauce pan of salted water which covers them by 2 inches. Bring them to a boil and then turn the heat down and simmer them for 15-25 minutes, or until tender (time will vary with potato size). Drain the potatoes, allow them to cool a bit and remove their peels. Use a butter knife to scrape the brown rind off of the cheese. If it is too thick, use a sharp knife to cut it off. Slice the Raclette into ¾-inch thick slices. Place the potatoes in a baking dish and arrange the sliced Raclette on top of them. Bake until the cheese is totally melted and covering the potatoes (about 10-15 minutes). Season with salt and pepper to taste. Spoon some potatoes and cheese onto serving plates and serve with crusty bread, cornichons, and pickled onions. As above, for either of these methods you first must scrape or cut the rind from the cheese. Then prepare your potatoes. If you have a gas stove, you can remove the grate and put your cheese on a fireproof plate or stone with the cut face as close to the flame as you can. I tried this, and it works pretty well. Make sure it is good and hot before you start scraping because it cools rather quickly. I haven’t tried this last suggestion but I think it would work. If you decide to give it a shot let me know how it turned out in the comments. Put nonstick pan over high heat on your stove top and put the cut face of the cheese facing down in the pan. When the cut face becomes soft and gooey, carefully remove the cheese from the pan (using gloves if necessary) and use a spatula or the back of a knife to scrape it over your serving dishes as above. Repeat as necessary when guests request further helpings of cheese. It has happened to all of us. You buy a bunch of parsley so you can chop up about a tablespoon of it to use for garnish, and the rest languishes forgotten in the fridge, where it eventually turns to sludge. Well, dear reader, it doesn’t have to be that way anymore. The gauchos of Argentina have come galloping to the rescue with a savory sauce that will fill your kitchen with the aroma of wild green places: Chimichurri. As usual around here, I went looking into the history of this traditional Argentine condiment and found some surprising things. Food historians do think it originated with Argentine cowboys. By 1580 when Buenos Aires became a permanent settlement, there were already vast herds of wild horses roaming the endless prairies of Argentina. The Spanish settlers brought cattle (a breed which would eventually contribute to the development of the Texas Longhorn) and the beef-centered cuisine of Argentina began. The gauchos lived as nomads, roaming the wild land, slaughtering feral cattle, cooking the meat in the open, and eating it with their trusty facónes. Due to this minimalist existence, when these men wanted a sauce for that hunk of steer roasting over an open fire, it isn’t likely they had garden-fresh parsley on hand. The original Chimichurri sauce probably consisted of dried parsley and oregano, along with garlic, vinegar, oil, and salt and pepper. It may have been more akin to English mint sauce (which is also vinegar-based), than the fancy, fresh Chimichurris of today. And how about the name? There is a folk etymology that attributes the sauce to an English or Irish soldier named Jimmy who joined in the fight for Argentine independence. His sauce was Jimmy’s curry, which was difficult for the Argentineans to pronounce and so it became Chimichurri. A more intriguing possibility is suggested in Steven Raichlen’s new book Planet Barbecue!. There is a word in the Basque language, “tximitxurri,” which can be interpreted to mean, “a mixture of several things in no particular order.” There is a Basque presence in Argentina, and they are well known as expert animal herders. I’m putting my money on tximitxurri, besides, I think every language needs a word for “a mixture of several things in no particular order,” don’t you? Alright, so let’s pull out the kitchen-equivalent of our facónes (gauchos didn’t have food processors), and get to work. Even though I love the idea of trying to reproduce the ur-Chimichurri, I did have fresh parsley to use up so we’ll go with a fresh version. The other thing I discovered in my research is that there are about as many recipes for Chimichurri as there are cattle in Argentina, and many of them don’t just contain parsley, some are even red instead of green. This one is adapted from the first rate web site Asado Argentina, whose webmaster is an American living in Argentina with a mission to bring a love for Argentine cuisine to the world. There is no real cooking involved in making this sauce, yet it made my kitchen smell wild and exotic. In the end it is a summery, kaleidoscope of flavors, that lingers on the palate, and only gets better with age in the refrigerator. 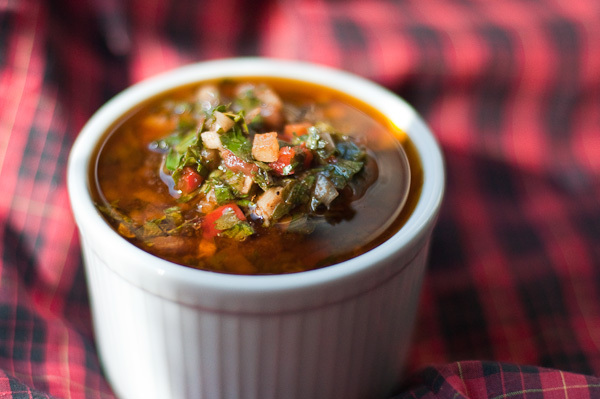 Chimichurri sauce is traditionally served with barbecued meats, primarily offal and sausages, but really, it goes with everything. Contrary to popular belief, the bay leaves used in cooking are not poisonous. We remove them from food because they are very stiff and could easily scratch the throat if swallowed. Here we crumble the leaves into very small pieces before adding them to the sauce, which makes them easier to swallow and allows the flavor of the herb to permeate the sauce. Put all of the ingredients except for the water, vinegar and oil together in a large bowl and toss well to combine. Let stand for at least 30 minutes. In a small saucepan bring the water and vinegar to a boil and pour it over the ingredients in the bowl and toss. This blanches the onions and garlic, creating a more mellow flavor. Let stand for at least 30 minutes. Lastly, add the olive oil and stir. The sauce is ready to serve, but it benefits from a day or two in the fridge, so do consider making it in advance. I find there is no better way to get to know a culture than by cooking some of its festival food. When I saw a recipe in Margaret Shaida’s absorbing historical cookbook, The Legendary Cuisine of Persia, for a special rice dish, traditionally served at weddings in Persia, I couldn’t resist. Not only does it describe a way of cooking rice I was completely unfamiliar with, but one of the ingredients is dried rose petals. The ancient land of Persia has influenced cuisines all over the world for the last 3000 years. Many dishes that we might think of as Arab, Indian, or even European originally came from Persia. For example the candy that we call “Turkish Delight,” is rAhat loqum in Farsi which, liberally translated, means “goes down easily,” which it certainly does! Lemons, saffron, pomegranates, and pistachios were first brought to the west when the armies of Alexander the Great returned from their conquest of Persia in the 4th Century, BCE. After the death of Alexander, the Persians reasserted their dominance and created an Empire which would last almost 1000 years, including Baghdad, eastern Iraq, Afghanistan, parts of Pakistan and the eastern half of what is now Turkey. This vast empire lay at the crossroads of the east, forming a bridge between the classical Roman and Greek world and the mysterious exotic lands of India and China. The Arabs conquered Persia in the late 7th Century, CE. Many historians remark that while Islam was eventually accepted by many Persians, causing a sharp decline in the indigenous religion of Zoroastrianism, the Persians largely kept many other aspects of their culture, including their food, intact. In fact, their Arab conquerors were so pleased with what they found on the tables of Isfahan and Ctesiphon (modern Baghdad), they proceeded to take many ingredients and dishes along with them as they swept into power in North Africa and the Iberian Peninsula. Later, knights returning from the the crusades in the 12th and 13th Centuries brought stories and examples of aromatic ingredients they had sampled in the east, many of which had been absorbed into Arab cuisine from the Persians. Once tasted, these exotic (and expensive) flavors were craved by the European aristocracy, and thus began the search for route to the east where they might obtain these treasures for less. Who knows, America might never have been discovered if it weren’t for the European love of these exotic spices. The Moghul emperors of India were actually the descendants of Muslim Mongols who had galloped down from the Steppes and conquered almost all of Persia in the 14th Century, and then stayed and became Persian in culture, language and food. The influence of Persian cuisine can be felt in several regions of India to this day. I won’t lie, this recipe is fussy, you can imagine an entire family of mothers, daughters, sisters and aunties, in the kitchen taking care of all the details involved. But that’s exactly what festival food is all about, bringing everyone together for a celebration. 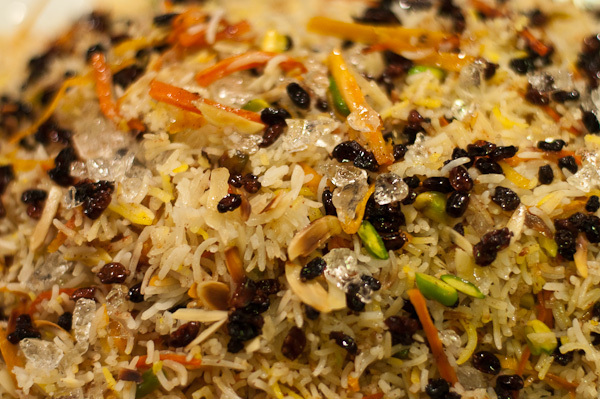 Ms. Shaida recommends serving Jeweled Rice with a some very simple chicken. I steam/sauteed some chicken breasts with salt, pepper and onions and a little liquid saffron (see below), but any simply flavored chicken will do, the rice is very complex and needs an almost silent partner. The visual impact of Jeweled Rice is really worth all of the fuss, the ingredients are cut to be symmetrical and complimentary in color and shape. It does taste sweet, but it’s not too much, with the barberries providing a tart contrast. And what a display of wealth; just imagine the cost of the cinnamon, sugar and saffron for a Persian family of the past. This very special dish is like precious jewels spilled onto a silken pillow, with glowing red barberries playing the part of rubies, pistachio emeralds, and finally a sprinkling of crushed rock candy diamonds, all accompanied by the scent of saffron, orange peel, and rose petals, conveying wishes of a rich, sweet life to the newly married couple. The unfamiliar ingredients such as the barberries (zereshk in Farsi) can be found at shops specializing in Indian ingredients. Kalustyan’s in New York, sells them via mail order. Wash the rice in 2-3 changes of cool water and drain. Put a cup of fresh water in a bowl, along with 2 tablespoons of coarse sea salt or kosher salt and stir until the salt is mostly dissolved. Pour the washed rice into the bowl and add more water until the water is about 1 inch above the level of the rice. Allow the rice to soak for 3 to 6 hours. Peel the carrots and cut them into julienne strips about 1½ inches long and ¼ inch wide. Put a little oil in a saute pan and fry the carrot strips over medium heat for about 10 minutes, stirring constantly. Stir in a tablespoon of granulated sugar, two teaspoons of liquid saffron, and 2-3 tablespoons of water. Cover and cook for 4-5 minutes, or until the liquid is reduced. The carrot strips will turn a darker shade of reddish-orange from the saffron. Use a vegetable peeler to peel the oranges, be careful to only take the orange part of the peel and not the bitter, white pith. Cut the peel into julienne strips as you did the carrots. Put the orange peel strips into a small saucepan and cover with cool water. Bring to a boil and then strain. Do this twice more, to get rid of any bitter flavor in the peels. Blanch the pistachios in boiling water and squeeze them out of their skins. Then soak in cool water along with the blanched almonds for about ½ hour to soften them. When soft, cut the nuts into slivers. Take 1 teaspoon of the almond slivers and toast them in a dry saute pan until browned (be careful not to burn them, they will brown quickly). Put the browned almonds in a separate bowl along with 1 teaspoon each of blanched almond slivers and pistachio slivers. This will be used to garnish the rice at the end. We’ll be adding a few other things to this “garnish dish” as we go. Put ⅓ cup water in a small saucepan with 1 tablespoon of granulated sugar, heat on low, stirring until the sugar dissolves. Add the remaining nuts and orange peel to the sugar syrup and stir. Bring to a boil and cook for 30 seconds. Strain the nuts and peel and reserve the syrup. Soak the dried currants in warm water for 10 minutes and strain. Add 1 teaspoon of them to the garnish dish. Pick over the barberries, to remove any extraneous vegetable matter, then fry them gently in just a little bit of oil for a couple of mintues, until they turn bright red. Be careful not to overcook them, as they burn easily. After your rice has soaked for at least 3 hours, drain it. In a 3-quart saucepan bring 2 quarts of water with 2 tablespoons of coarse sea salt or kosher salt to a boil. Pour the washed rice into the boiling water. Bring it back to a boil and cook for 2-3 minutes. At 2 minutes taste the rice, if it is done it should be soft on the outside but quite firm in the center. When it is done strain the rice and rinse it with tepid water. Rinse out the 3-quart saucepan, return it to the heat and add ½ cup of vegetable or peanut oil and 2-3 tablespoons of water. When the pan is sizzling, sprinkle one layer of rice onto the bottom of the pan. It is important to sprinkle the rice as it separates the individual grains which helps in the steaming process. If it is too hot to handle, use a serving spoon to shake the rice into the pan. Next sprinkle a layer of the carrots, orange peel, nuts, currants and spice mixture on top of the rice in the pot. Next sprinkle another layer of rice and then another layer of carrots, orange peel, nuts, currants and spice mixture. Continue in this manner, making layers, creating a conical shape in the pot, finishing with a layer of rice. At this point, pour the reserved sugar syrup over the rice along with the remaining liquid saffron. Use the handle of a wooden spoon to poke 2 or 3 holes in the rice, all the way to the bottom of the pot. Wrap the cover of your pot in a kitchen towel and place it on the pot. Cook on high heat for 2-3 minutes and then lift the lid slightly to see if it is steaming. You want to see a large amount of steam coming up, if not, cover and cook for another couple of minutes. Once you have lots of steam turn the heat down to low and cook for 30 minutes covered with the cloth-wrapped lid. After 30 minutes, the rice is done, however, if you have other things to prepare, it can be left over low heat for up to an additional hour without causing any harm. When you are ready to serve it, fill your sink with a couple of inches of cold water and put the covered hot pot of rice in it for about 2 minutes. This will cause a final burst of steam and help to loosen the rice at the bottom of the pot. Gently toss the rice in the pot to mix the layers, don’t scrape too far down in the pot, leaving the browned rice at the bottom intact, this will be served separately. To serve, sprinkle the rice onto a platter, creating a pleasing mound. Garnish the rice by sprinkling over all the items in the garnish dish, plus the barberries. Pour the melted clarified butter over the rice. Finally, crush the rock candy into “diamonds” and sprinkle over the rice. Go back to the pot once more and use a spatula to pry the crunchy, browned rice disk from the bottom and serve it on a separate plate, don’t worry if it breaks into pieces. In Persian homes, this is considered a delicacy, fought over by everyone, and sometimes it doesn’t even make it from the kitchen to the table. Serve with a some very simply flavored chicken breasts, leaving the rice to be the star of the show. The best saffron in the world is grown in Iran and costs about $175/ounce. But an ounce is a lot, since a little goes a long way. Less expensive saffron is available from Spain, India, Greece, Azerbaijan, Morocco, and Italy, so shop around. Make sure your saffron threads are quite dry, if not put them in a warm (not hot or they will burn!) oven for 2-3 minutes to dry them out. Put the saffron in a mortar with a small pinch of sugar, and use the pestle to pulverize them into a fine powder. Add 4-5 teaspoons of tepid water and let stand. Within 15-20 minutes the liquid will turn a dark orange color and is ready to use. Removing the seeds from cardamom pods can be tedious. Shops like Kalustyan’s, which sell Indian ingredients, will often have unground cardamom seeds, which is a lot easier. They are also a good source for the dried rose petals, which might be shelved with the teas. If you have a spice grinder, put all of the ingredients in it and grind them coarsely. Otherwise, pulverize the pistachios in a food processor, roughly crush the cardamom seed, rose petals and saffron together in a mortar and pestle and then mix them together with the cinnamon and ground pistachios.